Infant jaundice is a yellow discoloration that happens in the baby’s eyes and skin. Infant jaundice occurs d ue to the babies blood containing high levels of bilirubin, a pigment of the blood that is yellow colored. Infant jaundice is a prevalent condition, especially in babies before the 38 week gestation period (preterm infants) and some children that are breastfed. Infant jaundice commonly occurs when the baby’s liver is not mature enough to get rid of the bilirubin in the bloodstream. In certain cases, an underlying disease may cause jaundice. Treatment of infant jaundice often is not necessary, in most cases that need treatment respond well to noninvasive therapy. However complications are rare, a high bilirubin level associated with severe infant jaundice or inadequately treated jaundice may cause brain damage. Yellow skin and yellow in the white of the eyes are a sign that an infant has jaundice, and usually will occur between the second and fourth day after birth. To check if your child has jaundice you can gently press the baby’s forehead and nose. If the skin looks yellow where it is pressed, it is likely your child has a mild form of jaunce. If your child does not have jaundice, the skin color should simply be slightly lighter than its normal pigment for a moment. You should examine the baby in good lighting conditions. Most hospitals have policies to examine babies for jaundice before they are discharged. Newborns are recommended to be examed for jaundice during routine medical checks and at least every eight to 12 hours while they are in the hospital. Your baby should be examined for jaundice between the third and seventh day after birth when his/her bilirubin levels normally rises. If your baby is discharged before 72 hours after birth, you may want to make a follow-up appointment within two days to ensure that there is no jaundice. 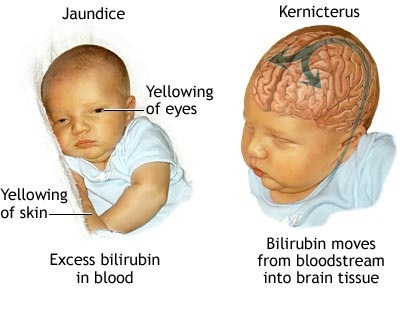 The following signs or symptoms may indicate severe jaundice or complications from excess bilirubin. The babies skin looks yellow around the arms legs or abdomen. It is yellow in the white of the baby’s eye. Baby seems sick or listless or difficult to awake. Baby is feeding poorly or is not gaining weight. Baby makes high pitch cries. Diagnose jaundice last longer than three weeks. Excessive bilirubin ( hyperbilirubinemia) is the primary reason jaundice. Bilirubin, which is responsible for the yellow color of jaundice, is the primary part of the pigment that is released from the breakup of used red blood cells. Normally the liver filters bilirubin from the bloodstream and realizes it into the intestinal tract. A newborn is an immature liver often can remove bilirubin quickly enough, causing an excessive of bilirubin. 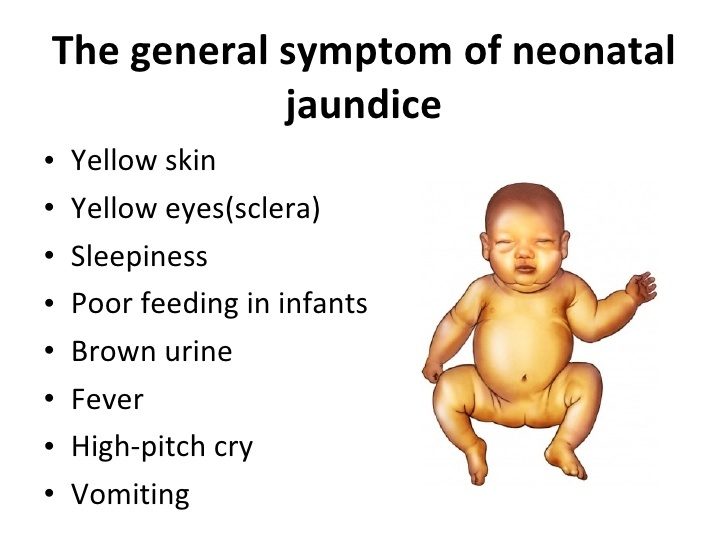 Jaundice due to these common newborn conditions is described as physiologic jaundice, and it typically develops on the second or third day of life. An abnormality or your baby is red blood cells that cause them to break. Premature birth, A baby born before 38 weeks may not be able to treat bilirubin as fast as full-term babies do. Additionally, he or she may feed less and have few bowel movements, resulting in less bilirubin eliminated through stool. Significant bruising during birth. If your infant gets abrasions from the delivery, he or she may have high levels of bilirubin from the breakdown or more red blood cells. Blood type, If the mother blood types are different from her baby is the baby may have acquired antibodies through the placenta that cause his or her blood cells to break down more quickly. Breast-feeding. Breastfed babies, particularly those who have difficulty nursing or getting enough nutrition from breastfeeding, are at higher risk or jaundice. Dehydration or a low calories intake may contribute to the onset of the disease. However, because of the benefits of breast -feeding, experts still recommend it. It is important to make sure your baby gets enough to eat and is adequately hydrated. High levels or bilirubin that cause severe jaundice can result in serious complications if not treated. Bilirubin is toxic to cells within the brain. If a child has severe disease, there is the risk that bilirubin is passed to the brain. This condition is referred to an acute bilirubin encephalopathy. Immediate treatment may prevent significant long-term damage. The following can also indicate bilirubin encephalopathy in an infant with jaundice. Your physician will most likely diagnose jaundice by the be basis appearance. However, the doctor will need to measure the amount of bilirubin in the babies blood. The levels of bilirubin (severity of juice ) will determine the cores of treatment. A skin test with a device described as a trans-cutaneous bilirubin meter, which measures the reflection of a unique light shone through the skin. Your doctor may order an additional blood test or urine test if there’s evidence that an underlying disorder causes your baby’s jaundice. Mild infant jaundice often disappears on its won within or three weeks. For moderate or severe jaundice, your baby may need to stay longer in the newborn nursery or be readmitted to the hospital. Light therapy (phototherapy). You child may be placed under special lighting that emits light in the blue-green spectrum. The light changes the shape and structure of bilirubin molecules in such a way that can be excreted in the urine and stool. The light is not, and ultraviolet radiation and a protective plastic shield filter out any ultraviolet light that may be emitted. During treatment, your child will wear only a diaper and protective eye patches. The light treatment may be supplemented with the use of light emitted pad or mattress. Intravenous immunoglobulin (IVIG), Jaundice can be related to blood type differences between mother and the child. This ailment results in the baby transferring antibodies from the mother that add to the breakdown of blood cells in the baby. Intravenous transmission of an immunoglobulin – a blood protein that can decrease levels of antibodies – may reduce jaundice and lessen the need for an and blood transfusion. Exchange transfusion – rarely when jaundice does not respond well to other treatments, a baby mad need to exchanging transfusion of blood. This involves repeat withdrawing small amounts of blood, which dilute the bilirubin and maternal antibodies, and then transferring blood back into the baby, a procure that performed in a newborn intensive care unit. When Jaundice is not severe, your doctor may recommend changing your baby’s feeding habits that can lower levels of bilirubin. Tak to your doctor about more frequent feeding. More frequent feeding will provide more milk and cause more bowel movements, increasing the amount of bilirubin eliminated in your baby’s stool. Breastfed infants should have eight to 12 feeding a day for the first several days. Supplemental feedings- If your baby has trouble breastfeeding, losing weight or is dehydrated, your physician may advise giving your baby formula or expressed milk to supplement breastfeeding. IN some cases the doctor may recommend using formal alone for a couple of days the resuming – breast -feeding. Preventing Jaundice – The best way to prevent jaundice is through adult feeding. Breastfed infants should have eight to 12 days of feeding fo the first several days of their life. Formula -fed baby should have one to two ounces or 40 to 60 milliliters) of formula each two to three hours for the first week.